I’ll be honest. I wanted to go into hiding after Tuesday’s election. I’m just so baffled in humanity right now. I keep on waiting for Ashton Kutcher to jump out and tell us that this entire thing was an elaborate episode of Punk’d but he never does. Everyday, I have to force myself to come to grips with this current reality. Since, I didn’t get to have the celebration that I thought I would on Tuesday. 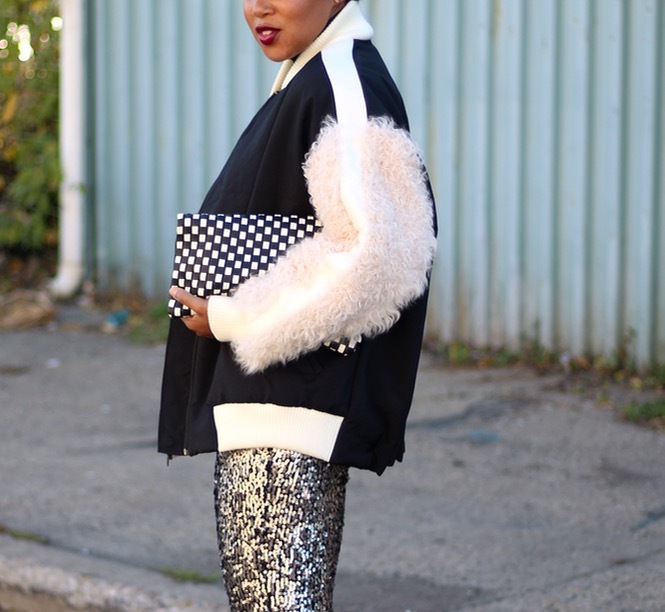 I threw myself a little texture party in this look with the bomber jacket from Echtego and the sequin pants from Nasty Gal. Dear Echtego Bomber Jacket, you had me at ‘sleeves’. Previous Post Memo 258: I’m Flying Solo! You are looking too ready for the holidays! Beautiful!! Stunning jacket. Give me Give me Give me!! !